If you want to learn how to play jazz guitar, you'll be glad to know a number of websites offer high-quality lessons for free that will help you make genuine progress. Guitarists who want to share their love of music by instructing others offer the lessons. Some of these sites offer paid options, but their free lessons are helpful and well worth checking out. Other sites offer all their lessons for free. As a beginning student, you need to get started with the basics of jazz guitar, including chords, chord progressions, scales, and arpeggios. You also need to learn the fundamentals of technique, such as changing chords and playing jazz licks. 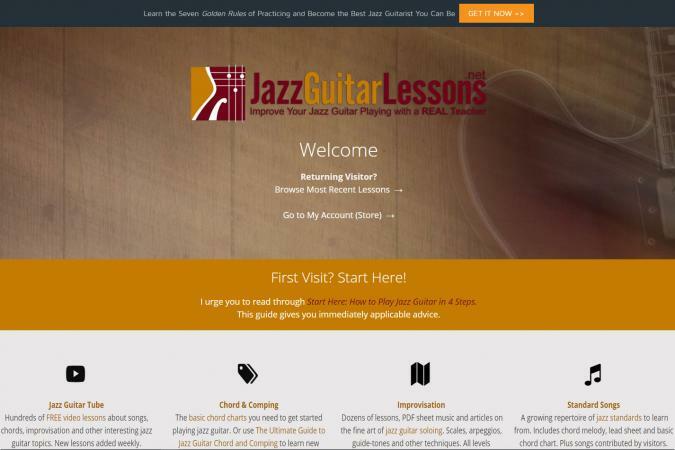 From Jazz Guitar Online, a site based in Belgium, you'll find a plethora of free guitar lessons that teach scales, arpeggios, jazz patterns, tips on improvisation, and playing jazz standards. The free lessons give you a treasure trove of tricks, tips, and skills. The site does a great job organizing lessons by topic, making it easy to browse. When you click on a lesson, you go to a page where you'll find notation and tabs for what you'll be learning and in some cases, audio to help train your ear. Beginning students will, in particular, get a lot out of the group of lessons offered on the bottom of the page, which are specifically geared toward people who are just starting out. In these lessons, you will learn how to read guitar tablature, play major scales and use guitar positions, and do the basics of improvisation. You'll also learn how to play dominant 7th chords and discover why they're important in jazz music. Jazz guitarists of any level will find much here to hone their skills and keep in good practice, including chords and progressions for various subgenres of jazz music like gypsy jazz and bebop, as well as how to construct the never-ending jazz guitar lick. You can also, if you wish, subscribe to the site's newsletter and download a free ebook on chords. Beginning players will find much to love at pickupjazz. Sam Blakelock, a jazz guitarist who lives in New York City, runs the site. He offers a number of useful and free guitar lessons that will have you up and playing in no time. Before you explore the lessons, though, you need to read his list of tips for getting started with jazz guitar, which offers encouragement and advice. When you click on a lesson, you get a lead sheet in PDF format, a video tutorial on how to play the song or exercise, tabs for chord progressions, sound files, and tips on theory that are applicable to the lesson you're studying. Chord Chart - Sam encourages his beginning guitar students to download a free chord chart, which he offers in printable PDF format. The chart includes the top ten easy chords that are used in playing jazz guitar, the five most colorful jazz guitar chords, and detailed information about reading tablature and understanding chord theory, chord shapes, and chord grips. Guitar Lessons - Individual lessons include topics such as arpeggios, chords, scales, and chord progressions. You'll also find a lesson on how to play Autumn Leaves, a jazz standard. Sam encourages students to check out his lesson on how to play bebop scales for jazz guitar since these scales will help you play smoother rhythm lines. His lesson on arpeggios includes major, minor, dominant, diminished, and half-diminished arpeggios, as well as tabs and tips to help you practice them. If you're a beginner, you'll find good foundational instruction on the Tony Oreshko Jazz Guitar website. Tony Oreshko is a touring jazz guitarist who has performed extensively and participated in many festivals in the UK. He offers free lessons in which he focuses on jazz chords and soloing. His instruction is geared toward newer guitarists who already know some basic chords, but who want to jazz up their playing. Tony's simple, straightforward lessons are presented as web pages with instructions, tips, and tablature. Guitar Lessons - On the topic of jazz chords, Tony teaches students how to substitute jazzy-sounding chords for their normal counterparts to jazz up a chord progression for a song. One technique he emphasizes is changing minor chords in chord progressions into dominant 7th chords. In his section on playing solos, Tony focuses on arpeggios and auxiliary notes, and how to use them in jazz music. Focus on Q & A - To enhance the value of his lessons, Tony focuses on answering questions that are posed to him by readers about playing jazz guitar, and these questions and answers form detailed new lessons that are filled with useful information. Some of the topics addressed include voice leading in chord progressions, playing guitar with jazz pianists, and mixing arpeggios and scales in jazz solos. 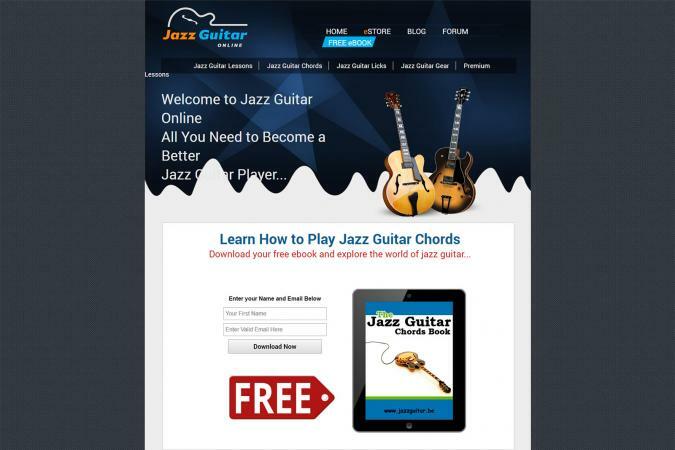 Beginning jazz guitarists will enjoy Justin Guitar, a user friendly, well-organized site that does a good job of covering the basics. Justin Sandercoe, a guitarist and songwriter who enjoys playing and teaching guitar in multiple genres, runs the site. On his site, Justin also offers guitar lessons in blues, rock, and funk. When you click on a lesson, you're taken to a page that features a video tutorial and guitar tabs or notation, depending on the topic of the lesson. Beginning students can get a solid foundation from Justin's Getting Into Jazz Lessons. You will learn basic jazz chords and rhythm guitar, and Justin will also give you tips on using a metronome, lending you a steady tempo you can use to improve your rhythm while playing. He offers lessons you might not find on other free beginner's sites, including topics like learning jazz lingo and how to read a jazz chart. Late beginners who are on their way to intermediate level will enjoy Justin's lessons on how to jazz up your blues playing, and how to play jazz standards like Autumn Leaves, Misty, and Blue Bossa. He includes lessons on developing your jazz skills and techniques, such as major and minor chord jazz extensions, why and how to alter 7th chords, common chord progressions, and secondary dominants, a harmonic function that occurs frequently in jazz music. As an intermediate student, you're probably looking for lessons that deal with broadening your technique with various kinds of playing styles. You'll also learn more about tunings and music theory and hone your ability to improvise. On Jazz Guitar Online, you'll find a number of free lessons that are suited to late beginners and intermediate-level students. The lessons are part of a larger site that offers articles on theory and improvisation and reviews of CDs and DVDs featuring accomplished jazz guitarists. When you click on a lesson, you'll be taken to a page that includes details about what you'll be learning, audio for the lesson, and either tablature or standard notation. Theory - Before starting your lessons, you'll want to dig into a brief study of music theory to make sure you're up to speed on major scales, chords, and intervals, and how these elements are used to play music and create harmony. Guitar Lessons - In the lessons, you'll learn about harmonic and melodic minor scales, how to play bebop lines over minor 7th chords, how to play turnarounds in your music, how to use tritone substitutions, and how to bring shell voicings, used in jazz piano, to guitar. 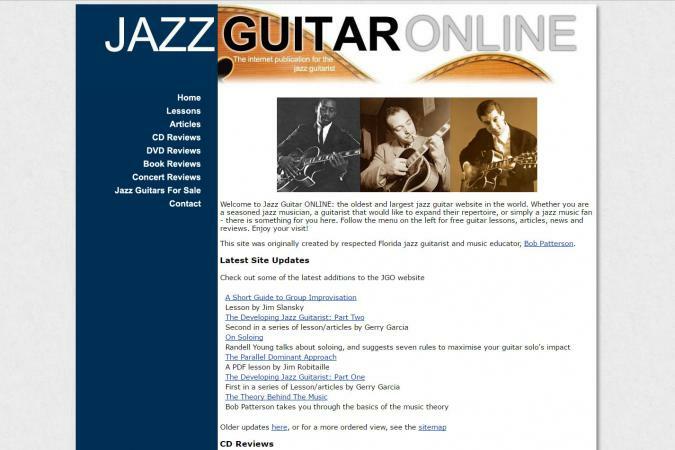 Features - In addition to lessons, you'll find other kinds of instruction, such as articles and Q & A sessions with Bob Patterson, the creator of Jazz Guitar Online. All of these features can help you improve your skills. Explore the site, and you'll find all kinds of useful topics, whether soloing, playing faster, group improvisation, or playing octaves. If you're looking for in-depth lessons for free, you'll definitely want to check out Terence Wright Guitar. Jazz guitarist Terence Wright offers lessons in a blog format. Newer lessons are on the front page and to view older lessons, you can scroll to the bottom of the page and click "Next Page." If you prefer to view posts by categories, simply choose from the menus Jazz Guitar Resources or Lesson Topics, located to the right. With each lesson, you'll get tabs and sheet music, audio samples, video tutorials, and a downloadable PDF of the lesson. Guitar Lessons - You can choose from a variety of lesson topics, including scales, chords, arpeggios, comping, improvisation, voice leading, and a system called CAGED, which will help you learn all the notes on a guitar fretboard, a feature you won't necessarily find on many free sites. Once the CAGED system helps you become comfortable and familiar with the entire fretboard of your guitar, you will find you can play jazz chord progressions much more smoothly. Free eBook - If you subscribe to Terence's newsletter to receive updates of new lessons, you will also get the Jazz Guitar Primer, a free 64-page eBook in PDF format. From the eBook, you'll learn about chord extensions, using arpeggios to play guitar solos, mastering jazz standards, and playing licks for chord progressions. You can pick up some nifty jazz guitar tricks from Guitar Compass's list of twelve free video lessons. The site also offers paid premium guitar lessons in a number of genres. The free jazz lessons put particular focus on the 2-5-1 chord progression, a very important progression in jazz music, then they teach you the progression using minor chords. You'll learn about voice leading within the 2-5-1 progression and using movable chord shapes with the minor progression. There's a lesson about comping and incorporating syncopated rhythms. You'll also study dominant blues chords and playing jazz licks. Advanced students want to keep developing their guitar abilities with challenging melodies and rhythms and innovative improvisation techniques. As an advanced student, you'll want to gain a deeper understanding of music theory to know when you can get away with breaking the rules, propelling your skills even higher. Advanced students, as well as students of all levels, will find plenty of material at Jazz Guitar Lessons to keep them busy for a long time. The site offers a wealth of free resources to anyone who wants to develop their skills on jazz guitar. The lessons come in various formats according to the media used, and the topic studied. Jazz Guitar Tube - You'll find a huge repository of free video lessons on Jazz Guitar Tube. Over 100 videos will help you study chords, rhythms, improvisation, licks, scales, and chord progressions. Chord and Comping - Guitarists of all levels will find something new and fun to learn from the Chord and Comping page. If you're an advanced guitarist, scroll down the page to the "Beyond Intermediates" section, where you will get lessons with written instructions and video aids to learn how to build your own chord melody and use rootless chord voicings over blues forms. Improvisation - If you're an advanced student, scroll down the Improvisation page to "Jazz Guitar Lessons: Beyond." From lessons with written instructions and video aids, you will learn unique tips about improvising on minor 2-5 chord progressions, diagonal scales, and the development of melody motifs to build improvisations. Standards - You'll find a number of jazz standards available for download. With each tune, you'll get a lead sheet, a chord chart, and the chord melody, all in PDF format. The web page also makes available jazz standards offered by site users who have supplied helpful comments about their arrangements. Jazz guitarists of all levels will find intriguing and innovative lessons on Play Jazz Guitar, but advanced students, in particular, will enjoy challenging themselves with lessons such as Crazy Triplets and Playing Outside, which will help develop skills like jazz masters Pat Martino and George Benson. The Crazy Triplets lesson teaches a rhythmic device you can use to learn to play triplets. From the Playing Outside lesson, you'll learn how to add elements to your solos that are outside your key, introducing a note of danger without adding disharmony. The lessons are given in web pages illustrated with tabs and standard notation. If you are an advanced guitarist, you're sure to find something to further develop your skills at Jazz Guitar Legend. 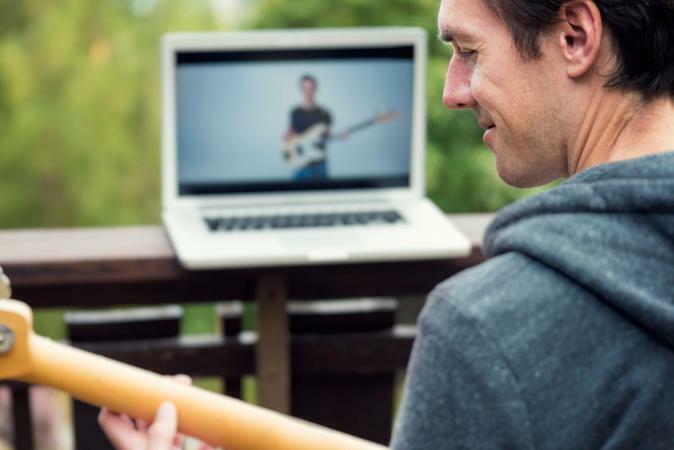 You can access free lessons that focus on improvisation, including how to break out of a rut, and how to use suspended chord voicings and guide tones. You'll also be able to download various technique-building exercises that will help you play sizzling jazz lines. The lessons consist of standard notation and tablature along with video instruction. Jazz guitar takes practice and commitment, no matter what your current level of prowess. The more time and effort you devote to perfecting your skills, the more proficiency you'll gain. Since jazz is a music form that relies heavily on creativity, musicianship, and improvisation, the skills you develop will serve you well in bringing greater and greater expressiveness and freedom to your music when you play and perform.